A new entry level smartphone has introduced by one of the well-known leading brand of Smartphones in the gadget industry. Wrapping off the curtains from the suspense, this new products has been pushed into the market by Samsung Mobiles as Samsung Galaxy Star GT-S5282 in the entry level ranges of smartphones. This new element is the cheapest device available under the company most prodigious range of Smartphone series familiar as Galaxy series worldwide till date. Back to back launches of Smartphone in the galaxy series has significantly increased the count of devices available in market from Samsung. Now Samsung has total 15 devices available under their Galaxy Series. However, it is possible to see some more launches by Samsung under Galaxy series at low price probably in the upcoming Q3 of this year. Leaving all speculations apart and throwing the light towards the details and technical specification of this newly launched device Samsung Galaxy Star GT-S5282, in terms of frame up, Samsung Galaxy Star sports 3.0 inch of Capacitive Touch screen display with 320 × 240 of pixels resolution. Dealing with it’s Platform dependency, this device runs on Android 4.1 Jelly Bean Operating system powered with a Single Core processor at a clock speed of 1GHz. Since Dual SIM technology is now a market trend , Samsung Galaxy Star also supports Dual Sim(GSM+GSM) technology, which enables the user to receive calls on one SIM number while taking a call from the other. In terms of storage specifications, this device is equipped with 512MB of RAM, 4Gb of Internal memory which can be easily expanded up to 32GB via microSD card slot. Enumerating it’s Photography specifications, Samsung Galaxy Star offered only with primary snapper options and lacks secondary snapper options. On it’s back side, it has been installed with a primary camera rated at 2MEGAPIXEL, which helps the user to click nice snapshot and capture their memorable moment in just a single click. Briefing it’s Connectivity specifications, this device supports 2G, EDGE, WiFi 802.11 b/g/n, Bluetooth 4.0, microUSB, FM Radio with RDS and Recording and a 3.5mm Audio jack. In terms of body dimensions, this device weighs 100.5 gms approximately and measures 11.90 mm thickness. To make the user experience more intuitive and responsive, it has an Intelligent Motion UI that maximizes smart features. Some of pre-loaded applications include ChatOn, Samsung’s cross-platform messaging service and one of the most starring feature it have Google Now, e-books, games, news, navigation, productivity, social networking and more. To make the life going on for this device, it has been equipped with 1200 mAh of battery. 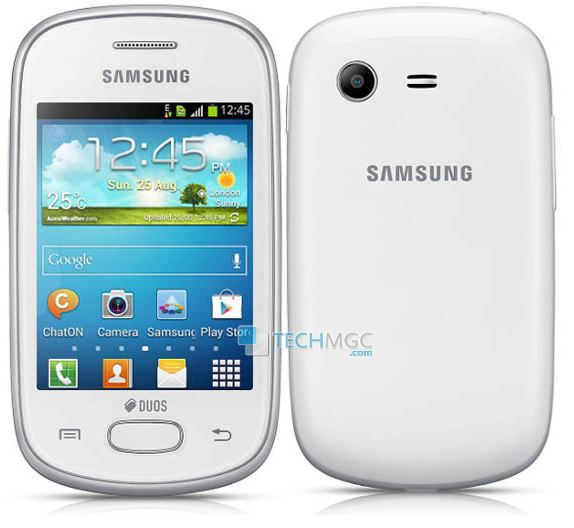 The Samsung Galaxy Star is priced at Rs. 5,240 (MRP), but it available at a market price of Rs. 4990. It also comes with a special offer which includes 250MB of free 2G data per month for 2 months from Vodafone. This offer is available for customers who purchase the the device before July 31 , 2013. I have purchased this mobile on 4th jun’13. overall mobile was good to use but only drawback is this phone available in MICRO SIM card option. You cannot insert normal 64k or 32k SIM card in this mobile. The only option is you have to cut SIM card and use it. cant we get a micro sim card wid same number??? Yes, you can ask your telecom provider for new Micro SIM for same number. You can either show your current sim damaged or return to them. May be it is because out of 4GB memory, around 1.9 GB is available for user, rest is reserved for system. Can I use this mobile as a modem ? Phone ta valo kentu price ar tulunay kharab. J akbar kenese tar shok…. … .. . thak r bole lav ki, tader dole to ami o pore.